The account is not authorized to login from this station. The problem started a few weeks ago. It is intermittent on a per-client basis and may last for hours or days. The problem does not affect all clients at once. For example, this morning one client was working and is now not; another client was not working earlier today and now is working. I've seen the issue with both Windows 7 Pro clients and other Windows Server 2008 R2 boxes trying to connects as client to the affected server's shares. The only search hits I'm getting from the Internet and Microsoft are referencing issues with W2K. There is nothing of relevant interest in event logs on either the server or the clients. What should I try next? This is only affecting one server. We have two other servers in our domain that provide network shares. Shares on those servers are rock-solid 24x7. No access issues whatsoever. This is doesn't seem to be caused by mismatched signing policies. The problem continues to "randomly" affect client computers. For example, this week my workstation could not access the shares one day, could the next, and then could not again the following day. As all the Windows 2000-related articles would have told you, had you read them, this error occurs when the client and server has conflicting SMB Signing policies configured. 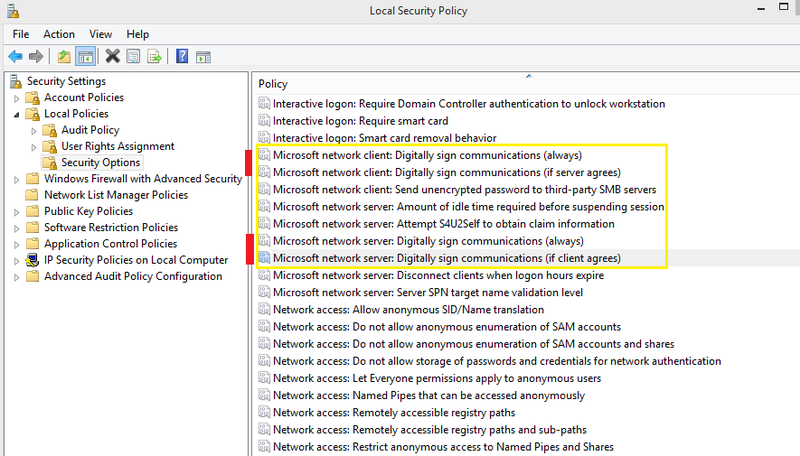 These settings can be defined using either Local Group Policy (gpedit.msc) or Group Policy if you use Active Directory. Our DNS server had two DNS A records for the problematic server. One record had the correct IP address and one had an a different address. Once I deleted the bad record, this issue went away. The bad record had a timestamp from around the time this issue started. At this point, I am not sure how the record got there, but I believe it was from a dynamic update. I am now in the process of setting up scavenging on our DNS servers. Like Mathias says, check the SMB signing between the two servers, I'm also thinking they did not match with each other. Check these settings on workstation\server. I would recommend enabling the following via GPO as well. Not the answer you're looking for? Browse other questions tagged active-directory windows-server-2008-r2 windows-7 domain or ask your own question. Routing & Remote Access in WS2008 R2 without DHCP role installed? How should DNS be configured for remote VPN access to a Windows Domain?